Thank you so much to bride Alison who sent us some beautiful pictures of her recent wedding. It was a wedding that we were all particularly excited about seeing as she chose different sorbet shades for her page boys, flower girls and bridesmaids and we were so thrilled to see the results. I think you’ll agree, it really works and they all look gorgeous. Alison chose our tulle Sorbet Sylvie for her flower girls in shades of shell pink, sky blue and julep green. 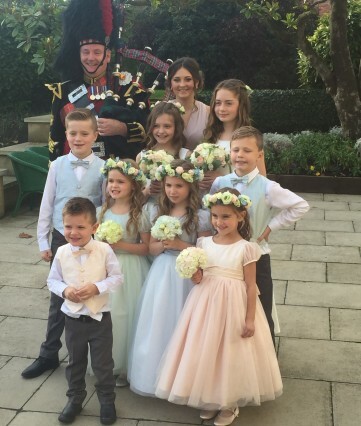 The boys wore a matching sorbet coloured silk waistcoat and the young bridesmaids wore our Claudette dress in ivory with pink and green sashes. The joy of choosing Nicki Macfarlane outfits for your special occasion is that you can truly create an original look. In most cases, the dresses in our Cygnet collection can be customised by choosing from our extensive colour chart – we have over 30 beautiful coloured silks, organzas and tulles. And as Alison has proved, why stick to one colour? If you have older bridesmaids, think about choosing a contrasting colour for the little ones or perhaps pick a shade that blends with your bouquet or the button holes. The options are endless!